My dog is 2 yrs and 10 months old. Is that to old for your programs…mainly training and socialastion? It is available for 3 years old dog to take our program but depends on your dog’s behavior. 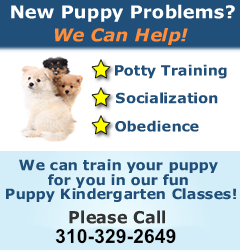 Please call 310-329-2649 for your free consultation and let us see your dog. FDA Pet Food Recall Info.